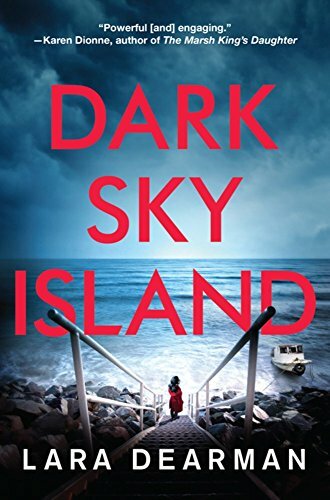 Lara Dearman returns to her Jennifer Dorey Mystery Series with Dark Sky Island, the follow up to her successful debut, The Devil’s Claw. Crime writers can either focus on one story out of all the killings in a large and violent city, or juxtapose the peacefulness of a town where no one locks the doors at night as a backdrop for a brutal murder. Dearman uses the tiny island of Sark as the ultimate small town location for crime. This idyllic island is both geographically and socially isolated. The residents think of themselves as islanders first and English second. They are out of sync with the rest of the world through their local politics, their spotty technology, and their physical remoteness. They do not trust the police, solely because they come over from a more populated island. Dorey, a reporter on nearby Guernsey Island, has a history with Sark. As a child, she visited regularly, her memories of the island warm and happy. Then, two years ago, her fisherman father vanished off his boat sailing near the island. When a set of human remains turns up in a cave near Sark’s Derrible beach, Dorey gets a heads-up from a cousin in the police department. She travels to the island to write up the story for the paper, but it’s not her only motive. Determined to uncover what really happened to her father, she uses the trip as an excuse to investigate his disappearance. Told in multiple points of view, Dark Sky Island’s DCI Michael Gilbert arrives on Sark to investigate the old bones. But old bones aren’t the only murder for him to solve. A man living nearby has his throat slit, not far from the cave that housed the long abandoned skeleton. Skipping around from character to character and past to present, Dearman weaves events into a tapestry held together by geography. Sark becomes a character as well. The legends of the island, the close-knit community, the rugged seas and high cliffs participate in the unfolding drama. In addition to the reporter and the DCI, Dearman writes from the perspectives of other police officers and residents of the island. There’s a large cast of characters with the potential to have committed the crimes. It’s like a locked-room mystery, with an island instead of a locked room. In the midst of the investigations, is a young boy, who may have seen more than he should, making him both a witness and a potential victim. Jennifer Dorey brings a life-long connection to the island into her investigation. She knows the world, even though she’s not a part of it. She also has history with DCI Gilbert, making her the perfect center to the impending storm. The harder she pursues the truth, the greater the danger. The novel is well paced, drawing readers into the puzzle and engaging us with the characters. Dorey is a complex protagonist. Smart, feisty, and capable, she refuses to give up, no matter what current threatens to pull her under. Meanwhile, DCI Gilbert pursues the killer with the slow, but relentless, drive of the sea. The second book in the series, it’s contained enough to be read as a standalone. Dearman includes enough background from the characters’ previous encounters to keep new readers informed, without feeling expositional for those already familiar with past events. Though Dearman brings all the threads to a satisfying ending, she’s clearly left room for another book in the series. With two solid books under her belt, it will no doubt be worth the wait. Elena Hartwell's most recent novel is Three Strikes, You're Dead, the third book in her Eddie Shoes Mystery series. The first, One Dead, Two to Go was a finalist for a number of best mystery honors including the Foreword Indie and Next Generation Indie book awards. The second, Two Heads are Deader Than One, received a RONE award nomination.